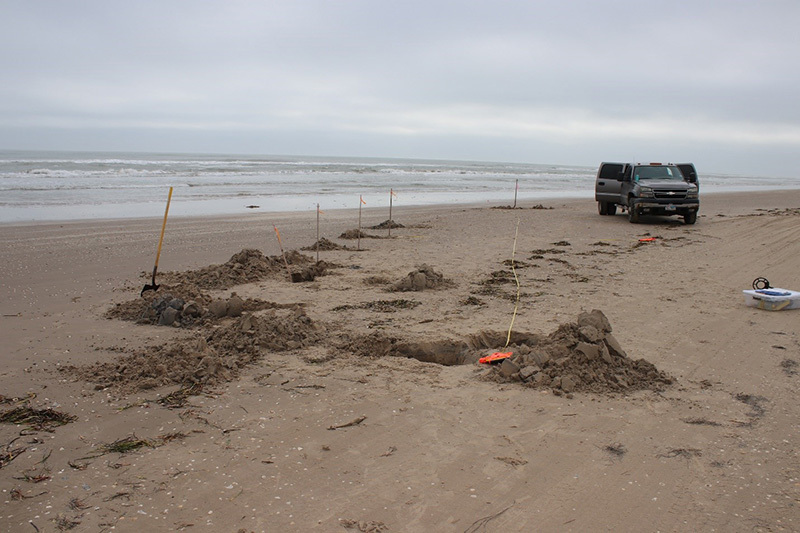 In a prior blog, Marine Archeology Program (MAP) staff described the types of archeological sites located in coastal public areas and waterways. These amazing finds are often vulnerable to man-made impacts, vandalism, and looting despite the protections specified in the Antiquities Code of Texas. 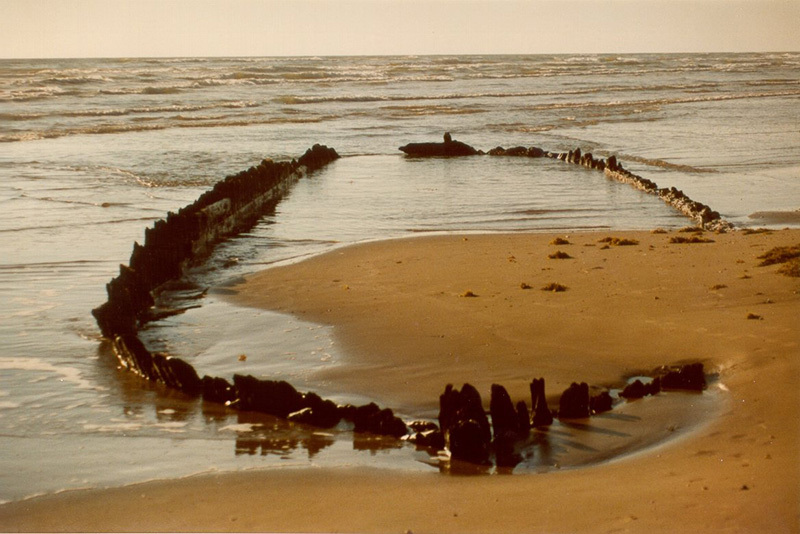 Shipwrecks on Texas beaches and intertidal areas are rare, and often only emerge as storms scour and remove sand, thus revealing these relics for modern observation and study. Storm events in recent years have exposed several historic shipwrecks along the Texas coast. Historic accounts report that dynamic weather and currents along the south Texas coast contributed towards the loss of vessels. Such events may also led to their rediscovery. 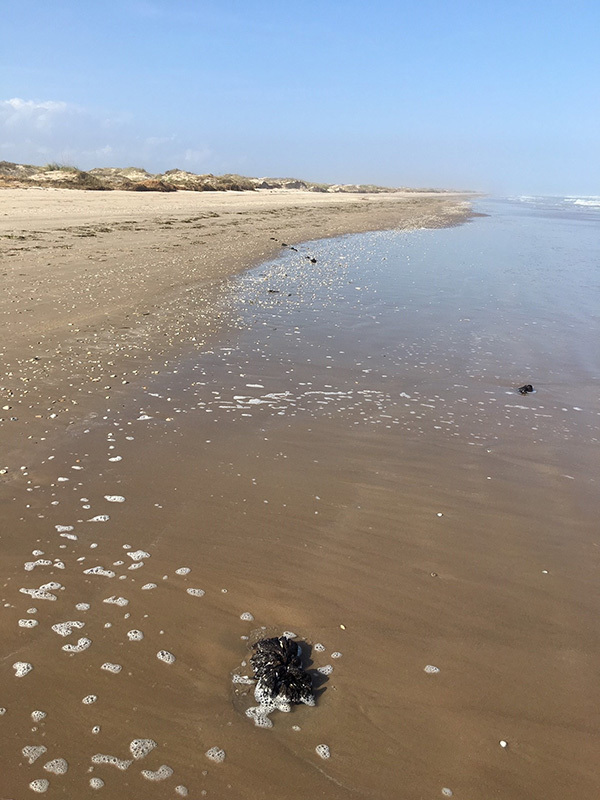 Recent storms have exposed two shipwreck sites on the south Texas coast, resulting in ongoing THC investigations. In the aftermath of Hurricane Beulah (1967), a large shipwreck was partially exposed in the surf on Boca Chica Beach. 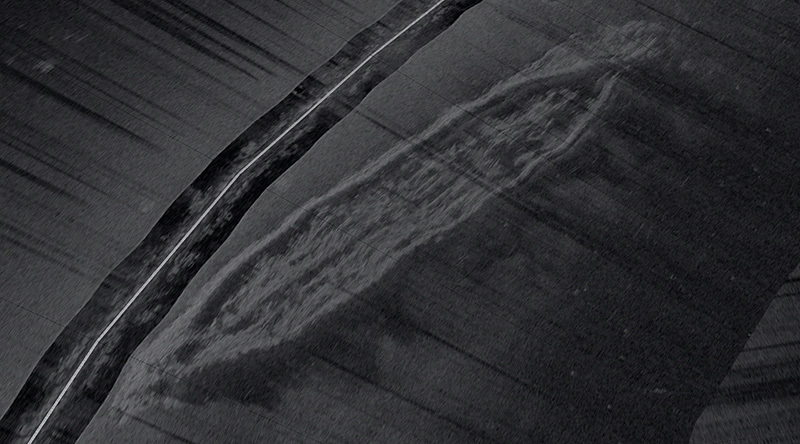 The site was quickly reburied by the shifting sands and it wasn’t until 1980 that the wreck was uncovered once again and brought to the attention of the THC (Figure 1). THC archeologists made two trips to the site to assess the condition of the wreck and record basic diagnostic information. In 2007, this shipwreck site was designated a State Antiquities Landmark (SAL) and determined to be eligible for listing in the National Register of Historic Places. This designation is the highest protective status awarded to Texas resources. 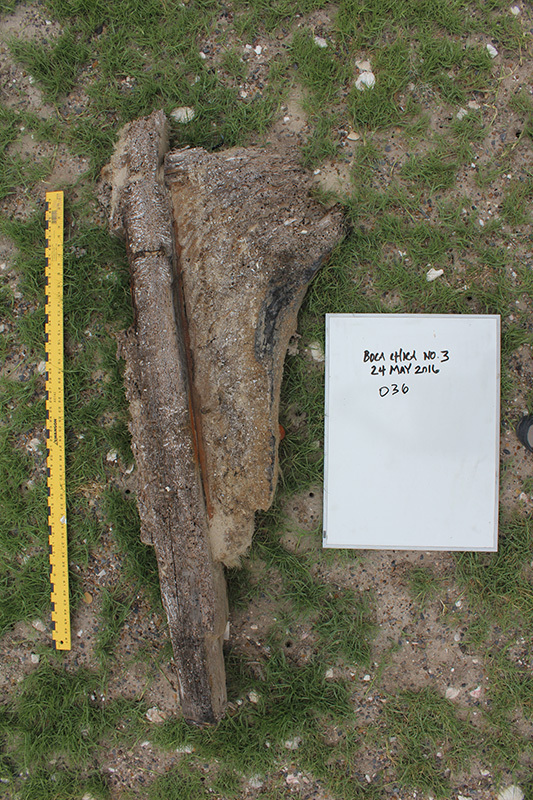 In December 2017, Keith Reynolds, a member of the THC’s Texas Archeological Stewardship Network (TASN) spotted wooden frame tips (frames are the ship’s “ribs”) exposed in the sand after a couple of northers. He alerted State Marine Archeologist Amy Borgens of the discovery on December 17th. Because beached wrecks can quickly become reburied, MAP archeologists Borgens and Sarah Linden quickly mobilized. Ten starboard frames and the sternpost were exposed while the rest of the ship remained buried in the sand (Figure 2a). The team took GPS coordinates and measurements of the visible frames. Only five frame tips remained exposed the following morning. Working under the MAP’s annual Texas Antiquities Permit No. 2035, the team uncovered an additional 12 frames (Figure 2b), exposing portions of the starboard side of the ship for a distance of 82 feet and 9 inches forward of the stern post. Despite their efforts and due to limited time, the team was not able to relocate the stem at the bow. New data was recorded to augment the work previously conducted by THC staff in 1980. Most importantly, the new photography—the first THC images of the wreck in 29 years—will help THC archeologists to monitor changes to the site. Coastal storms can be volatile and cause damage to historic archeological sites. During spring break of 2016, a storm washed more than 40 pieces of a shipwreck ashore at Boca Chica Beach. The THC was contacted by Rolando Garza, Archeologist at the Palo Alto National Historic Park. TASN marine steward Reynolds was asked by the THC to examine the beach, only to discover that beachcombers had been collecting the timbers and burning them in bonfires. 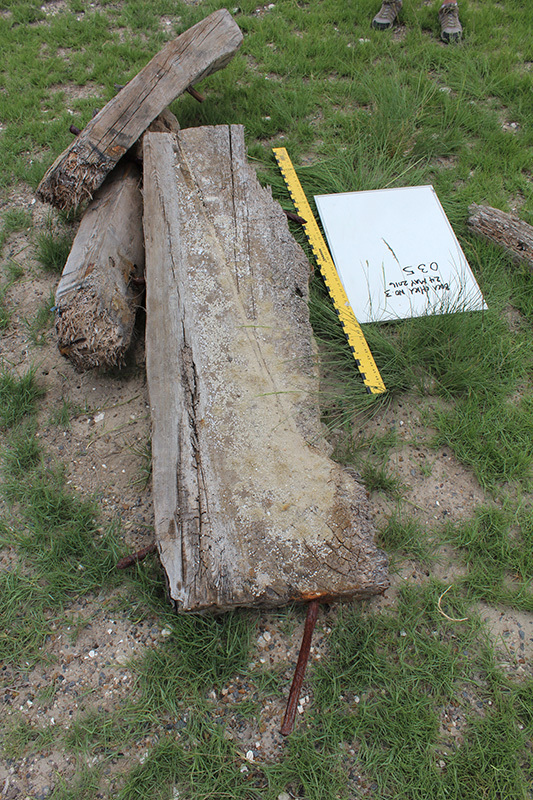 Reynolds recovered the remaining timbers for examination by the THC; the examples collected by Border Patrol personnel were added to the collection. THC staff continue to document and study the timbers. Discussions with underwater archeologist Roberto Junto of the National Institute of Anthropology and History (Mexico) revealed that portions of the shipwreck may have also come ashore in Mexico near the mouth of the Rio Grande River. The timbers, largely representing futtocks (upper frames) and outer hull planks, were discovered on the beach, spanning more than 8 miles. These remains represent an altogether new shipwreck from any of the three previously recorded. Some of these timbers represent upper portions of the vessel and show remarkably little damage from Teredo navalis, a shipworm that can cause severe damage to wooden boats. This evidence suggests the vessel may still be buried near shore with only the upper-level timbers being pushed onto the beach by storm action. In addition to isolated futtocks and hull planks, several articulated sections washed ashore, one as large as approximately 20 x 5 1/2 feet. This feature included several futtocks still attached to their outer hull planks (Figure 3). The futtocks measure 6 x 9 inches in cross-section and are spaced approximately 2 inches apart. Wood analysis conducted by Dr. Leslie Bush determined the hull planks are made of birch and the futtock sample is chestnut—both of which are atypical timbers for ship construction. The treenails were fashioned from beech and their ends were expanded and finished using square pages. In addition to the framing section, other larger timber features including a hanging knee (Figure 4a), nested lodging knees (Figure 4b), and a large longitudinal timber, known as a clamp. These timbers are often used to support deck beams. Similar Boca Chica Shipwreck No. 1, this vessel is fastened with a combination of wood and iron fasteners and likely dates to the 19th century or earlier. It is unknown whether it is sailing vessel or steamship. The shipwreck is now known as Boca Chica Shipwreck No. 3. 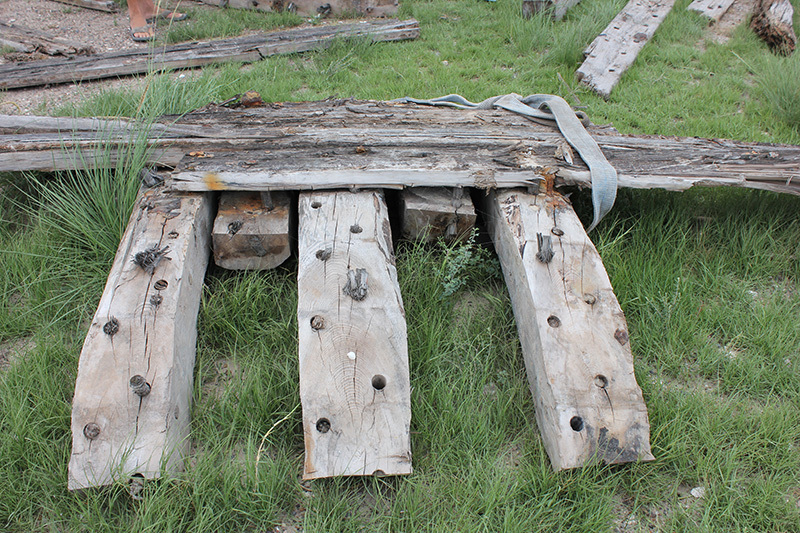 Since March of 2016, several ship timbers have come ashore been collected for the THC or observed and photographed by Reynolds. One large knee, possibly part of a set of lodging knees, became wedged among the jetty rocks (See gallery for Figure 5). 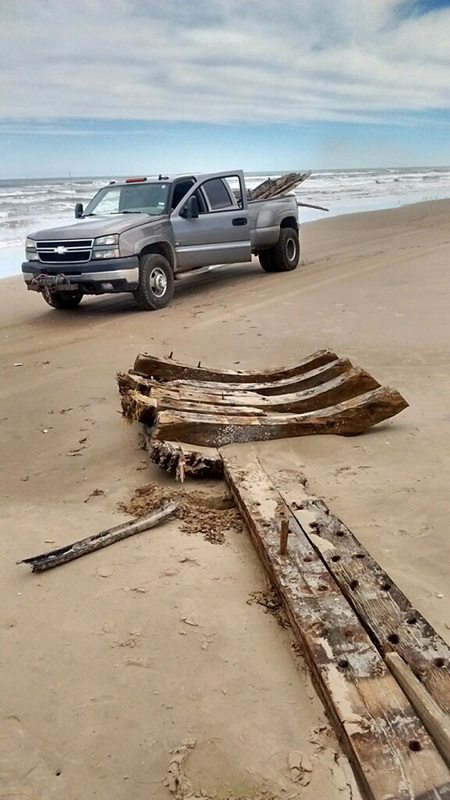 Tropical Storm Cindy exposed another shipwreck in approximately 15 feet of water (Figure 6) farther north along the Texas coast in Jefferson County. This completely submerged shipwreck is nearly 250 feet long. It came to the attention of Texas Parks and Wildlife Department (TPWD) on a routine Gulf sampling trip after it was buoyed as a net hang by a local shrimper. Gregory Lawrence, Robert Martinez, and Jonathan Davis of the TPWD Sabine Lake Marine Laboratory decided to collect sonar images of the obstruction. Upon the discovery that it was a shipwreck, they subsequently contacted the THC. It dates to the early 20th-century, but little else is known of this wreck. These exciting shipwrecks and other archeological sites are examples of the real places that tell real stories of our history. Archeological sites on state public lands are protected by law so that their stories may be shared with future generations. If you or anyone you know stumbles upon possible ship-related artifacts, please contact THC Marine Archeology Program staff Amy Borgens (512-463-9505) Amy.Borgens@thc.texas.gov or Sarah Linden (512-936-6466) Sarah.Linden@thc.texas.gov. 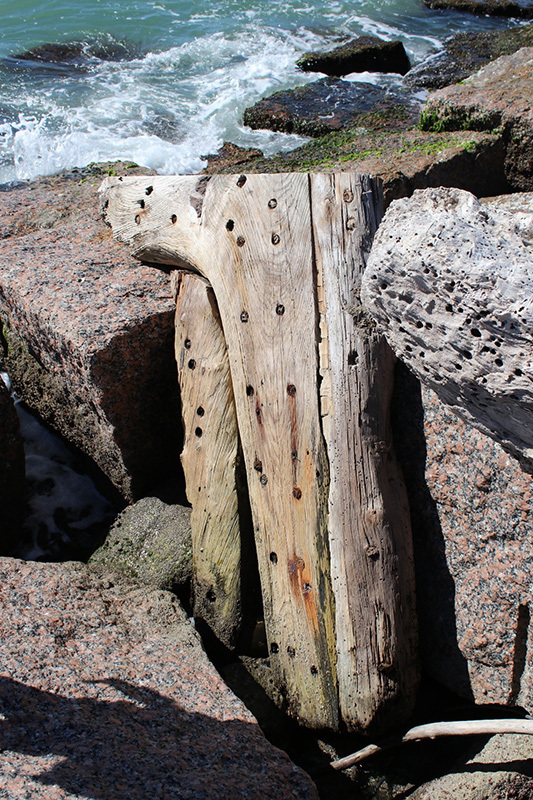 Learn more about what to do if you find an artifact or timber on the beach. This blog post content was summarized from TAC Permit No. 2035 annual reports (2016, 2018). Figure 1. Boca Chica Shipwreck No. 1 in 1980 (THC File Photo).